A method and apparatus for achieving a non-disruptive code load that includes assigning an endpoint to a non-disruptive code loading new process, loading the process into a memory location of a system and starting the process, wherein a previous process is instructed to forward all messages on its queue to the new process to where all new signals are processed. FIG. 3 is a block diagram of an alternate embodiment of the present invention. FIG. 1 is a block diagram illustrating several elements of a preferred embodiment of the present invention. A new or upgraded process  102 is compiled outside of the system 104. The new process 102 is comprised with an endpoint 108 (same as an endpoint of previous process 118) and a database 106. The endpoint 108 is in addition to the process identification that is generated by the operating system executable code 110. In the present invention the operating system executable code 110 can be the OSE operating system. The new process  102 is downloaded into the system 104 via the downloader 112 to eventually replace process A 118. In the present invention, the downloader 112, can be the dynamic program-loading feature of OSE. The downloader 112 allows a user to load the new process 102 or code into memory 114 without disrupting currently running processes. Any process loaded or currently located in the OSE operating system is identified by its identifier or process ID code. The identifier is a unique number to identify a particular process. The identifier is assigned and created by the OSE operating system when the process is loaded and executed into the system device  104. The identifier cannot be user specified. The current invention places an additional layer on top of the OSE operating system's identifier to identify processes and queues. This layer is labeled as an endpoint  108. The endpoint 108 is created at the time the new process 102 is compiled and not by the OSE operating system or the operating system executable code 110. The endpoint 108 enables the previous processes 118, 120, 122 to communicate with one another. The endpoint 108, as an identifier, is unique for a given process, but is similar if not the same for previous and new versions of the process. The similarity of the endpoints ensures seamless upgrading of the process. Processes already resident in the system are not required to obtain a new endpoint for the upgraded process. One of the differences between the identifier and the endpoint 108 is that the endpoint 108 is determined at compile time rather than at runtime and the identifier is generated at runtime. The OSE processes and the new process  102 communicate with each other through the use of the identifier. It is not necessary to alter this communication mechanism because the OSE processes are not capable of being non-disruptively upgradeable. Furthermore, if an OSE process communicates to a new process 102 on a regular basis, that new process 102 becomes persistent and then is unable to be non-disruptively upgraded. In the present invention, only a small percentage of the previous processes 120, 122 are or become persistent. As mentioned before, new process 102 will eventually replace process A 118. The new process  102 includes a database 106 and an endpoint 108. The database 106 can be initially set at the default setting or can be left blank. The new process 102 is received by the downloader 112, which is part of the system 104. The downloader 112 places the new process 102 into memory 114. At this point, the process 102 is started or executed by the OSE operating system 110. Additionally, the OSE operating system 110 generates an identifier with the ID generator 116. The new process  102 is loaded into memory 114 where it is then executed to eventually replace or upgrade the previous process A 118. As stated previously, the new process 102 includes an endpoint 108, which is generated at compile time of the executable code, and a database 106 that is initially non-existent, set to a default setting or empty. Once the new process  102 is loaded into memory 114, the ID generator 116 of the operating system 110 generates an identifier for the new process and placed into the database 106. A non-disruptive code load (NDCL) control process 124 or controller then communicates to the downloader 112 to obtain a list of new identifiers. The NDCL control process 124 informs previous process A 118 to perform a non-disruptive switchover to the new process 102. Contained in this signal payload is the identifier of the corresponding loadable new process 102. The passing or communicating of the identifier of the new process 102 to the previous process 118 allows these two processes to communicate with each other directly without the need to update the endpoint lookup table. The previous process  118 transmits data to the new process 102 to enable the new process 102 to update its database 106. In the present invention, these update signals are not altered during code revisions. This enables the update signals to be translated by any version of new process. The new process  102, upon receiving the update signals, updates its database 106. During this period of time, the new process 102 does not receive any requests from other sources to perform certain functions. The previous process 118 continues to service and process new requests as it sends update signals to the new process 102. Furthermore, the previous process 118 sends new update signals as its own internal database 126 is altered or changed from new requests from other processes. Once the previous process A  118 has completed the database transfer, the previous process A alerts the NDCL control process 124. At this point in time, the database 106 of the new process 102 is sufficiently similar to the database 126 of the previous process 118 such that the new process can seamlessly function as the previous process. The NDCL control process 124 then proceeds to update an endpoint lookup table 130 with the identifier of the new process 102 replacing the identifier 128 of the previous process A 118. Furthermore, the previous process A 118 forwards any remaining work on its queue to the new process 102. From this point forward, all new work or requests are being directed to the new process 102. The previous process A 118 can be deleted to free additional memory in the system 104. As previously stated, the endpoint 108 for the previous process 118 and new process 102 remains similar if not identical through an upgrade. The endpoint lookup table 130 completes the conversion for other processes to communicate with the upgraded process. In other words, the processes already resident in a system specify an upgradeable process by a known endpoint 108. This request to communicate with the other process by identifying the endpoint is then received by the endpoint lookup table 130, which in turn identifies the new process 102 by its identifier. The step of updating the process identifier in the endpoint lookup table for an upgraded process bypasses each process having to know the process identifier of pervious and new processes as well as ensuring a fast and efficient means for a nondisruptive code load. Note that it is possible for processes to be in a different formats because of differing code versions. However, these processes are still able to communicate with each other. The new process  102 is both forward and backward compatible with the differing code revisions in order to communicate and transfer data. FIG. 2 is a diagram illustrating the specific elements of the preferred embodiment. Consider a running system that includes both persistent and loadable processes running. All processes are communicating to each other by the use of signals being placed on their receive queues. The OSE operating system identifies queues by their identifier. The present invention places an additional identification layer on top of the OSE operating system identifier to enable processes to identify specific processes and queues. This new layered identification is called an endpoint  108 and is the way processes, loadable and persistent, communicate with each other. If an existing process A  202 needs to send a message to an existing process B 204, then process A 202 specifies the endpoint 108 of process B 204. The process A 202 proceeds to lookup the endpoint 108 in the endpoint lookup table 130. Once the endpoint 108 of process B 204 is discovered, the endpoint 108 is translated into a process identifier and then the message from process A 202 is routed to the process B 204. The endpoint lookup table 130 is comprised of all the identifiers for the processes. The endpoint lookup table 130 allows processes to free up memory space by letting one central location store the common information. This centralization is also useful for updating such that only one table needs to be updated and thus there are no race conditions. In FIG. 2, the endpoint 108 of process A 202 is not the same endpoint 108 of process B 204. FIG. 2 illustrates the preferred embodiment of communication between two loadable processes. FIG. 3 is a block diagram of an alternate embodiment of the present invention. FIG. 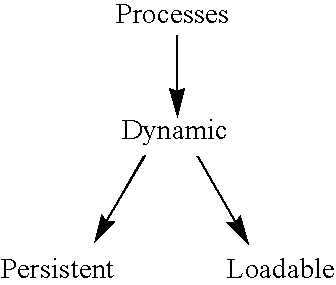 3 is a block diagram illustrating a method of the present invention. This alternate embodiment is begun with the step  302 of loading a new process 102 into memory 114. The new process contains at the minimum an endpoint 108. The next step 304 involves starting or executing the new process 102. At this point, the new process 102 is present in memory 114 but not processing requests or messages. The OSE operating system 110 initiates the step 306 of creating an identifier for the new process 102 once the new process 102 or executable code is loaded into memory 114. Once loaded into memory  114, an NDCL control process 124 begins the step 308 of communicating with the downloader 112 to obtain the identifier of any and all new processes 102. The NDCL control process 124 performs the step 310 of informing the previous process 118 to initiate a switchover the new process 102. After the previous process 118 receives this request, the previous process 118 begins the step 312 of transmitting data to the new process 102. The data can be the internal database 126 of the previous process 118. The new process 102 uses this data to update its database 106 in preparation for replacing the previous process 118. Once all the data has been transmitted by the previous process 118, the previous process 118 performs the step 314 of informing the NDCL control process 124 that the database has been transferred. In response, the NDCL control process 124 executes the step 316 of updating the endpoint look table 130 with the endpoint 108 of the new process 102. After which, NDCL control process 124 informs pervious process 118 to forward all remaining requests on its queue to new process 102. Previous process 118 executes step 317 and carries out the fowarding of all pending requests on its queue to the new process 102. At this point, the new process 102 begins the step 318 of processing all requests. The NCDL control process 124 can perform the step 320 of removing the previous process 118 from memory 114.
instructing a previous process to perform a non-disruptive switchover to the new process. 2. The method as in claim 1, further comprising the step of recording the identifier by a downloader. 3. The method as in claim 2, further comprising the step of obtaining the identifier for a control process. 4. The method as in claim 1, wherein the step of instructing the previous process is accomplished with the control process. 5. The method as claim 4, wherein the step of instructing the previous process to perform the non-disruptive switchover to the new process further includes transmitting the identifier to the new process. 6. The method as in claim 5, further comprising sending signals from the previous process to the new process. 8. The method as in claim 6, wherein the signal requires updating a database of the new process. 9. The method as in claim 8, wherein the previous process continues to process and service signals received on a previous process queue. 10. The method as in claim 6, further including the step of notifying the control process that the database has been transferred to the new process. 11. The method as in claim 10, further including the step of updating the endpoint lookup table with the identifier of the new process. 12. The method as in claim 10, further including the step of forwarding any remaining messages to a new process queue, in response to the database being transferred. 13. The method as in claim 12, further including the step of processing signals by received by the new process queue. 14. The method as in claim 12, further including the step of deleting the previous process from memory. 15. The method as in claim 7, wherein the signal requiring updating the new process database is not upgraded and remains approximately the same. means for instructing a previous process to perform a non-disruptive switchover to the new process. 17. The apparatus as in claim 16, further comprising means for recording the identifier by a means for downloading. 18. The apparatus as in claim 17, further comprising means for obtaining the identifier for a control process. 19. The apparatus as in claim 16, wherein the means for instructing the previous process is accomplished with the control process. 20. The apparatus as claim 19, wherein the means for instructing the previous process to perform the non-disruptive switchover to the new process further includes means for transmitting the identifier to the new process. 21. The apparatus as in claim 20, further comprising means for sending signals from the previous process to the new process. 22. The apparatus as in claim 21, wherein the signal requires updating a new process database. 23. The apparatus as in claim 22, wherein the previous process continues to process and service signals received on a previous process queue. 24. The apparatus as in claim 22, further comprising means for notifying the control process that the database has been transferred to the new process. 25. The apparatus as in claim 24, further comprising the step of updating a lookup table with the identifier of the new process. 26. The apparatus as in claim 24, further comprising means for forwarding any remaining messages to a new process queue, in response to the database being transferred. 27. The apparatus as in claim 26, further including the step of processing signals by received by the new process queue. 28. The apparatus as in claim 26, further including the step of deleting the previous process from memory. 29. The apparatus as in claim 22, wherein the signal requiring updating the new process database is not upgraded and remains approximately the same. a controller in communication with the memory device, wherein the controller informs a previous process to perform a non-disruptive switchover to the new process. 31. The apparatus as in claim 30, further comprising a downloader in linked to the memory device, wherein the new process is received by the downloader and placed in the memory device. 32. The apparatus as in claim 30, further comprising a signal sent by the previous process to the new process. 33. The apparatus as in claim 32, wherein the signal includes the database of the previous process. 34. The apparatus as in claim 32, wherein the signal includes the identifier of the new process. 35. The apparatus as in claim 33, further comprising a lookup table linked to the operating system, wherein the lookup table include the identifier. 36. The apparatus as in claim 35, wherein the controller updates the lookup table with the identifier of the new process. 37. The apparatus as in claim 30, wherein the new process is an interrupt handler. 38. The apparatus as in claim 37, wherein the interrupt handler is upgraded.